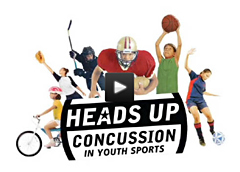 Center for Disease Control’s (CDC) Heads Up – Concussions in Youth Sports online training program. The training program will take you approximately 30 minutes to complete. This training program is an extremely valuable resource in preparing you to properly respond to head related injuries with players. Upon completion of the training program, you will gain access to a Certificate of Completion. Nutrition for Soccer – A practical guide to eating and drinking for health and performance. Whenever highly talented, motivated and well trained players meet in competition, the margin between victory and defeat is small. Attention to detail can make that vital difference. Diet affects performance, and the foods that we choose in training and competition will affect how well we train and play. Every player needs to be aware of their personal nutritional goals and of how they can select an eating strategy to meet those goals. Every player is different, and there is no single diet that meets the needs of all players at all times. Individual needs also change across the season and players must be flexible to accommodate this. Diet may have its biggest impact on training. A good diet can help support consistent intensive training while limiting the risks of illness or injury. Good food choices can also promote adaptations to the training stimulus – this can lead to more improvement for the same training load. The right diet is also important in preparing for games and in hastening recovery afterwards. Getting the right amount of energy to stay healthy and to perform well is key. Too much and body fat increases: too little and performance falls, injuries increase, and illness results. Carbohydrate supplies the muscles and brain with the fuels they need to meet the stress of training and competition. Players must be aware of what foods they should choose to meet their carbohydrate needs, how much should be eaten, and when these foods should be eaten. Foods rich in protein are important for building and repairing muscles, but a varied diet containing everyday foods will generally supply more than enough protein. Well-chosen vegetarian diets can easily meet protein needs. Eating a small amount of protein just after training may help promote adaptations in response to the training stimulus. A varied diet that meets energy needs and is based largely on nutrient-rich choices such as vegetables, fruits, beans, legumes, cereals, lean meats, fish and dairy foods should ensure an adequate intake of vitamins and minerals. Excluding any of these food groups means that more careful food choices must be made. Maintaining hydration is important for performance. Fluid intake before, during (where appropriate) and after exercise is important, especially in hot climates. When sweat losses are high, foods and drinks consumed must contain sufficient water and salt to replace these losses. 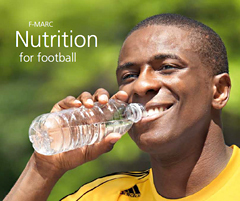 Download FIFA’s Full Nutrition Guide: in PDF form. Soccergoals.com is owned and maintained by Keeper Goals of Milwaukee, Wisconsin. At Keeper Goals we have been manufacturing and distributing sporting goods equipment including soccer goals and nets since 1978. 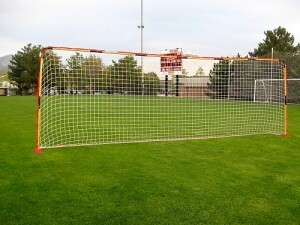 In 2011 Keeper Goals was delighted to acquire Goal Oriented of Denver, Colorado. We now distribute a full-line of Goal Oriented products manufactured in our factory in Butler, WI. Take your FFIT™ flat soccer goal anywhere (41 pounds)! Breaks down to 4′ segments so it fits easily in your car’s trunk or back seat. Assembly is quick & easy. Under 5 minutes, (two people), no screws, no snaps, and no sag! Aluminum tubing is of a top quality, rigid, strong alloy, designed to resist bending, even under extreme pressures. Steel bases are zinc-plated (non-rusting) and when secured to the ground with the spikes (provided) you’ll be amazed at this goal’s stability. FFIT™ goals are the first in their class to include the NSP Safety Option – a 1/4″ neoprene pad designed to attach to the base to help prevent serious injury. Carrying case made from toughest Cordura Nylon. Tekk® is the leader in the next generation of training equipment. With its patented one-piece design it is the strongest and largest trainer on the market with 40 square feet of surface area. With a powder coated frame made of aircraft grade aluminum and 3mm thick steel brackets it has the strongest rebound of anything available. The angle adjusts to seven positions for all around training. The Tekk® Trainer is extremely strong and durable and built to last for years. With the Tekk® Trainer you don’t need anyone else. You can practice by yourself and get better on your own with the exact same product the pros use at their training sessions. The ball comes back to you at game speed, simulating real game situations. This enables field players and goalkeepers to master their technique and control. Whether you are 6 years old or a pro you can take your game to the next level with the Tekk Trainer. Designed for players ages 6 and up.